What am I up to now? Firstly, I still take pleasure in working with wood, how it behaves, how it cuts with sharp tools, the feel and the smell of it. Very important to me are the physical processes of making with wood and the craft skills involved in art making. Secondly, I use relief carving to unite picture making with the physical deliberateness of carving, to combine colour with the crisp use of light and shade and to play with shape, form, pattern, and textures. My drawing has to be clear and concise so as to translate into images that are efficiently carveable. This is the language and material I use to make sense of all the things we celebrate and worry about. Particularly, my desires, my wants and needs, and my sexuality as the force that drives my actions and reactions, my content and discontent; the energy that creates and destroys. Hence, as a man, I look at the swing of a girl’s skirt, the curl of her hair, as she sashays past, and enjoy all the shapes, forms and textures that express her vitality. Another starting point is the imagery of advertising that exhorts us to buy. While on one level I might comment on the aspirations advertising exploits, on another, I simply enjoy the shapes and forms of the perfume and shampoo bottles, the elegant handbags, watches and shoes, and the mobile phones that advertising portrays. While I might imply a critical view about consumption, over production, food that is edible only if it has a label on it, the commodification of everything, and the loneliness of bus stops as the cars drive by, I am still a child playing in the sand. As a continuing practice alongside all of this is my observational work with all natural forms. 2008-2018 Still busy with carved wood ware production, occasional school art projects, commissions, trying to fit in some personal artwork, and since 2015 teaching woodcarving with adults one day a week. 2015 - continuing Teaching at the Monday Woodcarving Sessions, Queens Park Art Centre, Aylesbury. At college in Bristol I started constructing sculpture from timber I hauled from the river Avon. Thus my partnership with woodworking and artmaking began. In Wales, I picked up some carpentry skills as I repaired buildings and made windows for customers and started carving pieces of firewood, while developing a sculpture language I had begun at college. 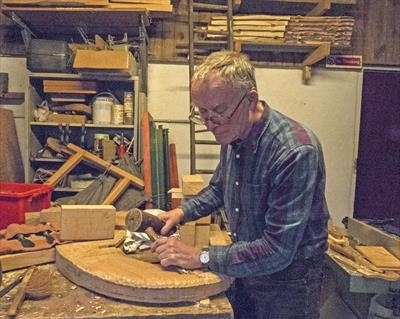 It was whilst in Wales that I completed my first ever carving commission: I carved the posts on a four-poster bed which was a group effort and the complete bed was exhibited in Aberystwyth and I am told that Prince Charles purchased it! It was natural, then, that after training as an art teacher I ended up in London teaching woodwork! When I went part-time I carried on making sculpture and then when I stopped teaching altogether I started doing carpentry and set up a workshop in a squatted house. There, I got so busy making sash windows for people that my sculpture making was forced aside. Then, when I moved to Gawcott, two things happened that got me going again. My sister brought a gift from Mexico - a painted carved wooden fish. I was struck by its crude vitality and knew I wanted to make things like this. I had already travelled round Mexico once and found the abundance of folk art and craftwork thrilling and exciting. 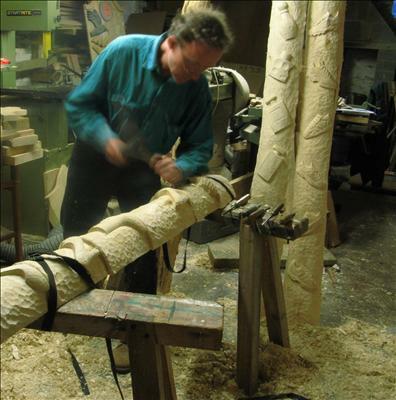 Next, I spent a summer school week at Parnham House, carving with Howard Raybould, whose work I had been admiring. This is what got me going with my carved woodware business. Since then, 1985, I have been doing a lot of public art commissions, teaching in adult education, and leading art making projects in schools, as well as developing my personal artwork. 2015 July MK Calling. An exhibition at Milton Keynes Gallery celebrating the wide spectrum of creativity in and around Milton Keynes. 2014 August "conNEcTWORK"- group exhibition at Arts Central, Milton Keynes, on the theme of connectedness and community. 2008, February Milton Keynes General Hospital. Solo show, the upper main corridor exhibition space. 2007, December Stantonbury Gallery, Stantonbury Campus, Milton Keynes. Solo show of relief carved panels and wall pieces. 2007, August The White Wall, The centreMK. Site specific installation on the theme of the Milton Keynes shopping experience. 2001-03 'Celebrating Boxes'. a Tullie House touring exhibition. 'Objects from a Lifetime', Derby Museum and Art Gallery. 'Vessel', Portsmouth Cathedral with Hampshire Sculpture Trust. 1998 'Dovetales', Narrative in Contemporary Carving, Rufford Craft Centre, Nottinghamshire. 1997 'Inspirations', Waterfront Museum, Poole. Work inspired by the museum collection. 1994-95 Narrative Woodcarving, a Winchester Gallery touring exhibition. 1990 'Mum. This One's for You', solo show at The Moot hall, Daventry. 1989 'Just Wood', The Black Swan Guild. Frome. Milton Keynes Craft Guild Exhibition, Smith's Gallery, London.